Directions to Trailhead: Take the 118 Freeway to Yosemite exit. Go north on Yosemite and turn right on Flanagan Dr. The trailhead is at the end of Flanagan Drive on the right. 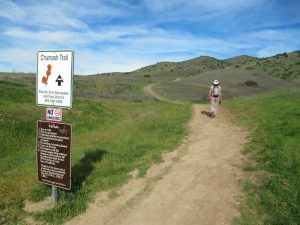 The Chumash Trail is a 2.7 mile long trail that extends from Flanagan Drive in Simi Valley to the top of the ridges 1.3 miles north of Rocky Peak. It is a part of the Chumash Natural Park that includes sandstone rock formations, caves, and beautiful vistas of Simi Valley. This is a moderate to strenuous hike that is used by runners, hikers, and bikers. The land is owned by the Santa Monica Mountains Conservancy and the Rancho Simi Recreation & Park District. It is maintained by the Rancho Simi Trailblazers and patrolled by the Volunteer Trail Safety Service. Click here to see the weather at the trailhead.